Dunedin’s 50th Annual Art Harvest. 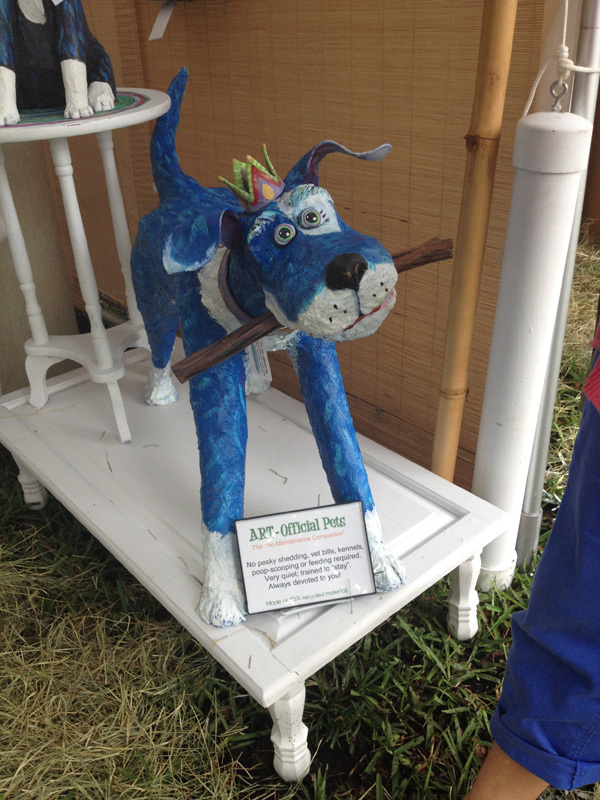 Yesterday was a little dicey, weather-wise, for all of the Florida dog-friendly events. We woke up to the sound of pounding rain on the roof and immediately thought of Dox-A-Palooza that was to take place in Lakeland. No worries, though, as loyal friends and lovers of Dachshund Adoption Rescue & Education (DAREtoRescue.com) came from all over to support the 8th annual event. Representing The New Barker, Puck the Wonderful Wiener Dog, gave it his all during the Wiener Dog Races. In Cocoa Beach, thunder and lightning kept our rover reporter Tina Valant out of the sky. As the official photDOGrapher for the Florida International Dog Surfing Championship, Tina was scheduled to go up in a helicopter to catch an eagle eye’s view. After the stormy weather subsided, dogs hit the surf with their boards, hanging 20 and breaking records. Stay connected to The New Barker dog magazine blog and Facebook page for a preview of photos. We took a small break from working on the winter edition of The New Barker dog magazine to visit Dunedin’s 50th Annual Art Harvest. It was just supposed to be a little R&R stroll to clear the head, so we weren’t equipped with a notebook or camera. And what happens every time we travel without a camera? Thank goodness for the ole iPhone. 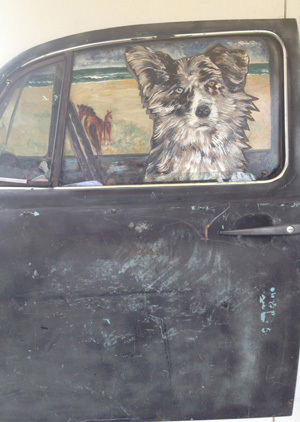 Dog and art lovers, if you are out and about today (Sunday) check out this show. The art, jewelry, photography, pottery, sculpture and more are really all just beautiful work. Our picks of the day were, of course, dog-themed. First, we visited with Tampa artist Michael Vistia, whose background is in Realism. He combines his talent with the Contemporary style of artist Alexander Dimou. 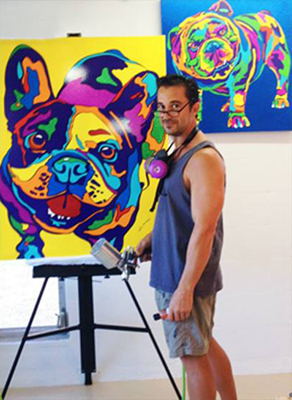 Their Art Harvest gallery is just an explosion of color, with dogs as the main subject. Our next oooh-ahh moment was with John Whipple. The former Nickelodeon artist works in oils, acrylics, charcoal on paper, wood and sheet metal. The exhibit includes his popular hand painted sculptures, many of them known as Misfits, consisting of cast resin and found objects. Stop in and say hello. 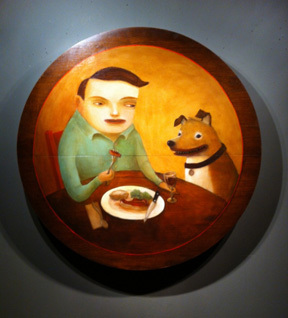 We loved this piece, titled Dinner Guest. Any dog lover will relate to the subject matter. Pug, Yorkie and Georgia Bulldog fans will enjoy the black and white photography of Phyllis Frankenfield. Her “Unique Letter” series, showcases her photographic eye and creative sense of humor. Another photographer, Lee-Margaret Borland from Jacksonville, featured some fun dog images, including Teasing Terriers and Dog Tired. 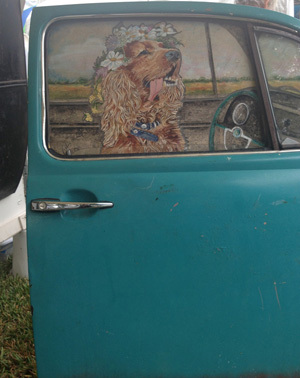 New Smyrna Beach artist, Kim Kaiser was wowing dog lovers with her acrylic portraits of dogs. Her canvas? 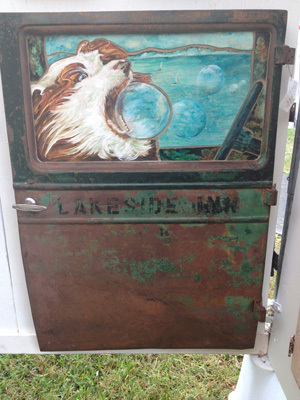 Antique truck doors. Really a fun exhibit. 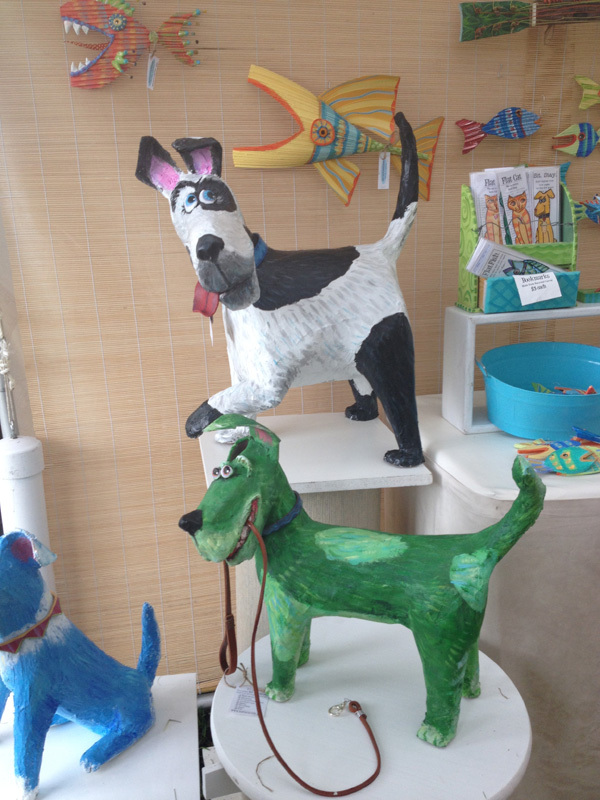 We were happy to run into Palm Harbor artist, Joyce Curvin whose paper mache dog sculptures will just make anyone happy. 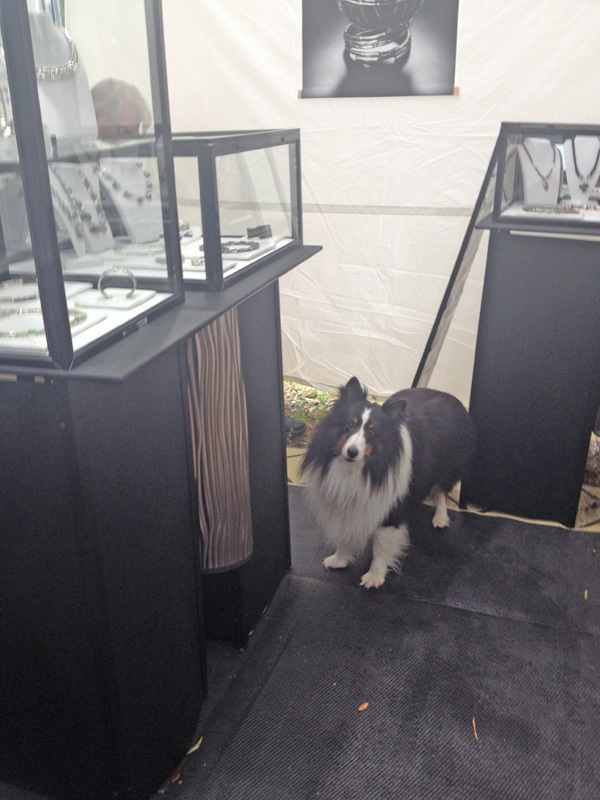 We met Dubhan, a Shetland Sheepdog at Pam Fox’s display of precious jewelry and boxes. She travels the art show circuit with the sweet dog, who is an old hat at meeting and greeting people. Pam told us that Dubhan means “black and white’ in Celtic. One more artist, whose work was just fascinating, is from Lakeland. Do not miss Stephen Koury’s display of contemporary wildlife art. You will think you are looking at big game photography. His attention to detail is beautiful. It’s going to be a beautiful day here in Florida for dogs and their humans. Enjoy it, with one extra hour to spare. If you do happen to visit Art Harvest, there is plenty of food and beverage on site at Highlander Park, site of the Dunedin Fine Art Center at 1143 Michigan Boulevard. Need another fix of dogs? While in Dunedin, visit the Pinehurst Pub today between 2p and 5p for the Dunedin Doggie Rescue monthly dog wash. It’s how this group raises money to help pay for vet bills, while caring for their foster dogs. This will probably be the last dog wash of the season until 2014. The pub is at 1270 San Christopher Drive, not far from Art Harvest. Remember to dog responsibly. C’mon over, Carol with dear, sweet Molly. The art show goes on until 5 today. Looked like a great event – wished I could have been there to see it ! Previous Previous post: The Amazing Power of DOG. Next Next post: The New Barker Dog Magazine Is Thinking Big.